I notice a common thread among many piano students, young and old. They tend to play measure to measure, doting heavily on downbeats as if the first beat of each bar begs for reinforcement. Perhaps a Marching Band might fall prey to stepping through a muddy football field with over-emphasis, just to make sure everyone “falls” into line. No so, when playing a Minuet from Anna Magdalena’s Notebook. One of them with its rolling arpeggio in both soprano and bass parts, must be finessed, shaped, and spun along in a conversational manner, given the pronounced interaction of independent voices. (counterpoint) The player, therefore, must sense phrase groupings with their natural resolutions. (voice dropping) And not to forget SINGING as one of best illuminations of threaded lines. 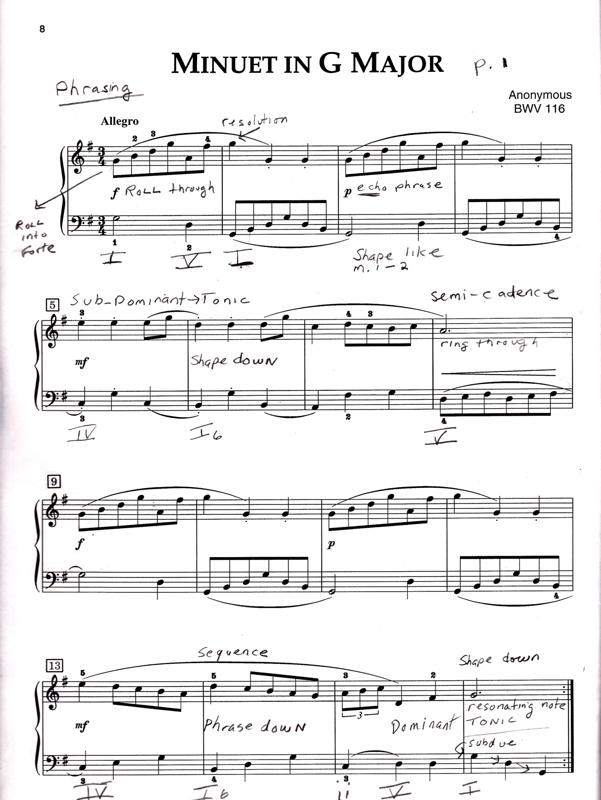 In this piano lesson by SKYPE to the southern reaches of the US, my adult pupil and I worked on BEFORE and AFTER listening–how to resolve or taper down a measure that flowed out of a DOMINANT underlying harmony, for example. Too often, pupils will overlook preceding musical events such as these that impact those that follow. Previous postShould a piano student be a carbon copy of the teacher?